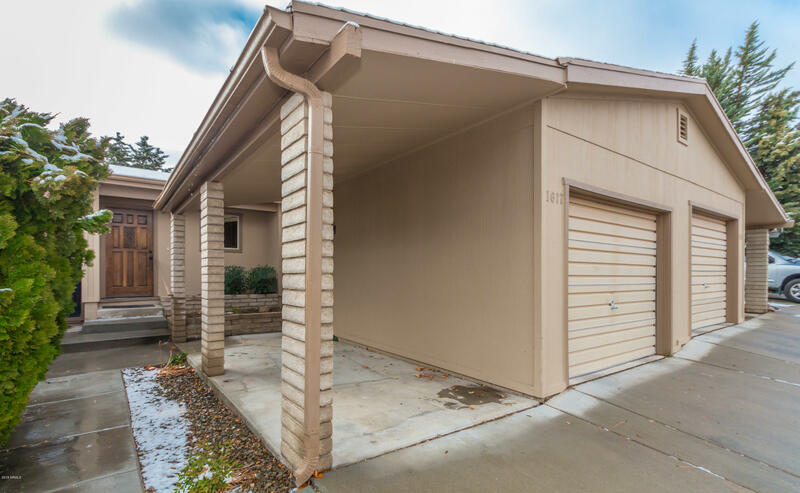 Beautiful recently updated Butte Haven single story Townhouse, 2BD/1.5BA/1 car Covered Carport, 917 Sq Ft, front patio & private gated rear yard with covered & open patio + big Apple tree. New Granite kitchen w/deep sink, dark cabinetry, new stainless French Door Refrigerator, new stainless appliances, newer carpet, new engineered wood flooring, newer interior 2 tone designer paint, sunny sliding glass doors + newer stainless front load washer & dryer. Master BD w/newer carpet & pad, 2 tone paint, window w/horizontal blinds, walk in closet + ceiling fan & 1/2 bath. 2nd bedroom with sunny sliding door to private rear yard, nice Vertical blinds, sliding door closet, lighted ceiling fan & 2 tone paint w/tall baseboards. Guest bath w/newer full tiled step-in shower, tall executive height Granite counter. Single Car Garage with side utility door & nice cabinet storage + Epoxy floor. Hurry it won't last.